Four More Bob Movies Coming to DVD!!! 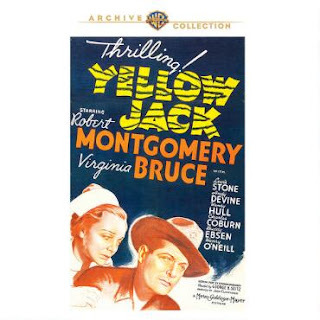 Warner Archive (wbshop.com) is including four Bob movies in their new releases for April: The First 100 Years (1938), Yellow Jack (1938), Haunted Honeymoon (1940), and Piccadilly Jim (1936). 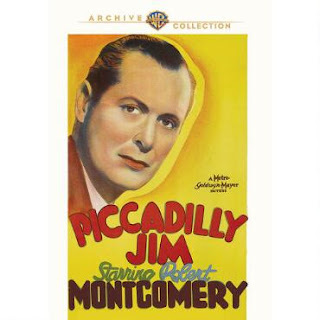 Piccadilly Jim is my fave of the four ... Bob and Madge Evans with a great supporting cast including Frank Morgan, Eric Blore, Billie Burke and Robert Benchley ... what's not to like. 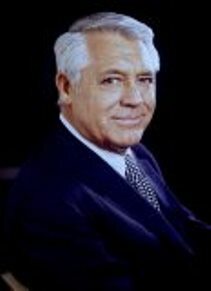 Keep an eye open for uncredited roles by Dennis Morgan, Dennis O'Keefe and Bess Flowers, the Queen of Hollywood Extras! 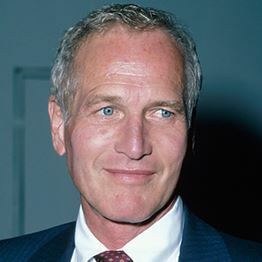 Why Do Men Age So Well? In our youth oriented culture being young is everything. I’m not saying I agree with this, but nowadays it seems especially true in Hollywood and especially true for women. Older actresses have a very hard time finding decent parts, but older actors…….not so much. Men seem to be able to stay leading men well past their 40s and 50s. I hate that saying “Women get old, men get distinguished,“ but I guess in Hollywood at least, it’s true. 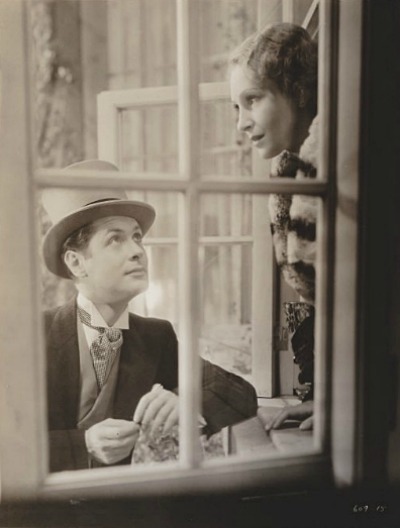 For me, the main problem of the movie is the co-star, Nora Gregor. Being from Austria, Flesh is her first English-speaking role, a challenge for anyone. 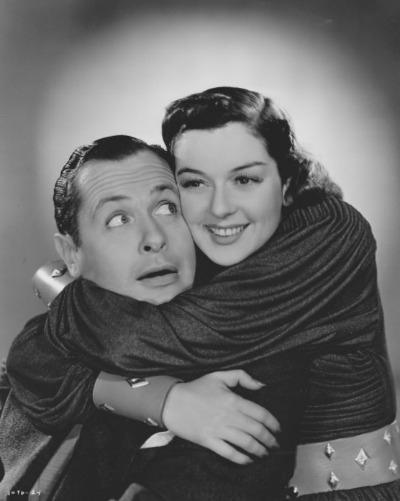 Secondly, she does not appear to be the woman Bob's character would fall in love with at first sight. 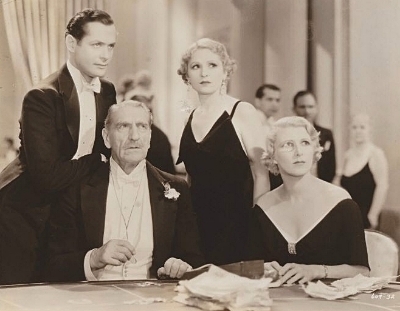 In the photo below, she is with the aristocratic woman Bob was pursuing only for her wealth. To me, they look too much alike. Bet you can't tell for sure which of the ladies is Nora. Flesh has a number of good lines. 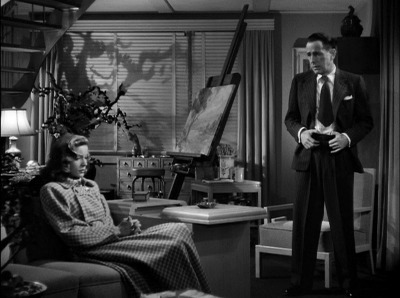 Favorites ... Bob asks Nora why she didn't tell him she was in love with him. Her response, "Because, I didn't know until you hit me!" 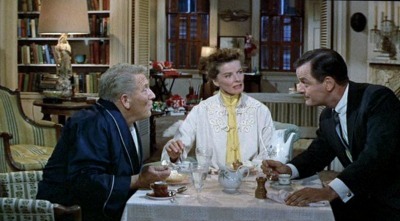 And, when Bob introduces Nora to his father as the woman he wants to marry, Dad advises him not to, "it's not in you to be faithful to one woman." There is definitely a serious side to the movie, the threat of jail for gambling debts, Nora's character on the verge of poverty and so forth, not entirely a feel good movie. But, putting everything else aside, it is definitely a great opportunity to watch the 28-year-old Bob in his prime. Just remembered. 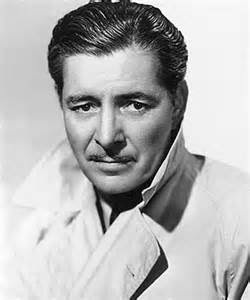 Ray Milland has an uncredited role as a party guest. Look for him at about 8'30" into the movie. On June 14, I can throw away my crappy DVD copies of Mr. Jordan, because the Criterion Collection is releasing it on DVD and Blu-ray. It will be a restored version, with many extras. 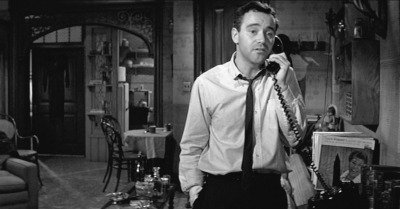 Check out more at Criterion's website. I am not sure if Vanessa: Her Love Story (1935) was ever one of Bob's better movies. 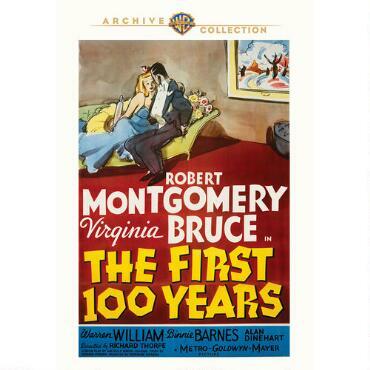 What I can be sure of is that the 74-minute version available today is a butchered version of its original self. Costumers of the day ran closer to 100 minutes, which means about 25 minutes were at one time cut from the movie. 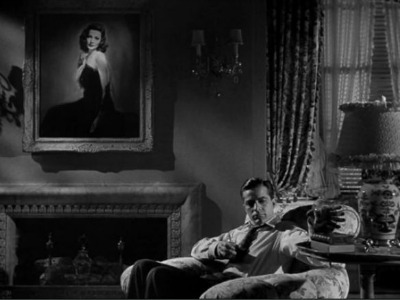 Whether the blame can be placed on early TV programming which edited movies to fit in a 90 minute or two hour slot along with commercials, or if it was the studio's decision to trim down the movie for use on a double bill. Fortunately, there are existing stills that gives one an idea of what is missing from the movie. Unfortunately, they show that most of the cut scenes are of Bob. 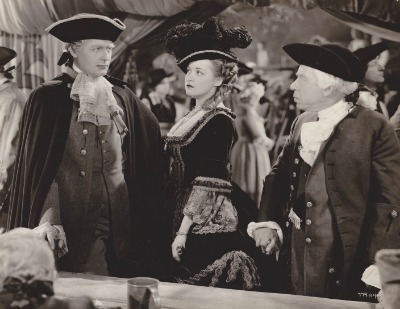 It does explain why Helen Hayes seems to have such a larger role than Bob, even though he has top billing. 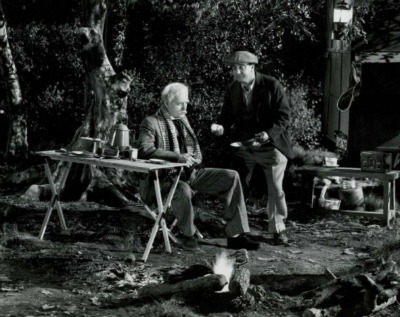 From what I can piece together, the movie originally began with an aged Benji (Bob) telling the story of Vanessa at a campsite. It continues with this scene of Benji and Vanessa. 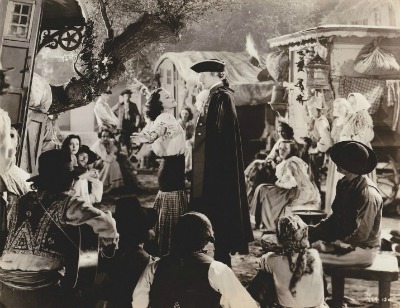 Perhaps he is introducing her to the vagabonds as an explanation of his desire not to be tied down, whether by marriage or a staid place in society. And then back to Benji at the campsite, showing he never really changed. 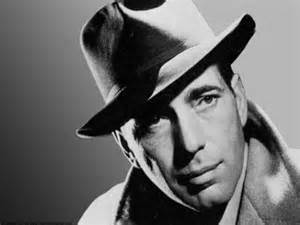 It was only his love for Vanessa that could make him give up his vagabond/roguish life. It is all one big guess, of course. It does make you wonder what the original movie was like. In Hollywood, it is not unusual for a star to fall for his or her co-star. It happens all the time. Always has. Sometimes it works out and sometimes not. 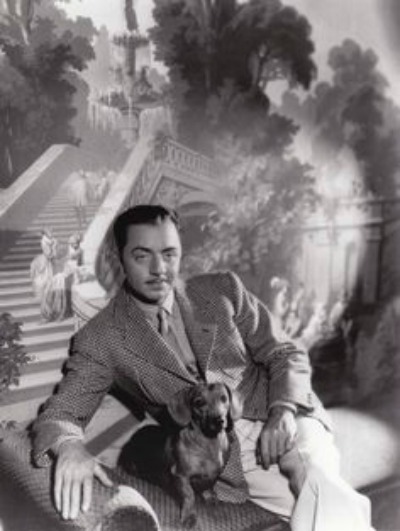 During the 1934 filming of "The Thin Man", actor William Powell lost his heart to a co-star. 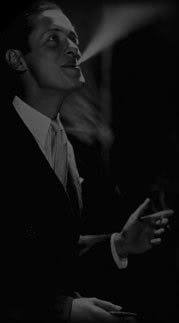 No, it wasn't Myrna Loy, although Bill and Myrna became close friends and remained friends for the rest of Powell's life. No, Bill fell for his four-legged co-star, Skippy, a.k.a. Asta. The adorable wire-haired fox terrier became a hot property for his owners, comedienne Gale Henry and her MGM property master husband Henry East. 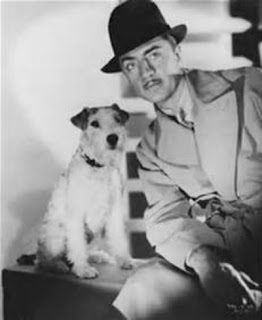 Besides playing "Asta" in the first four "Thin Man" films, the dog worked in such films as 1938's "Bringing Up Baby", 1937's "The Awful Truth" and 1938's "Topper Takes a Trip". While most canine actors brought in $60 a week, Skippy earned $250 a week for his owners. 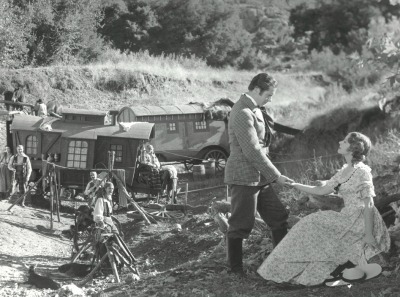 It was a nice sum during the 1930s for even human actors. 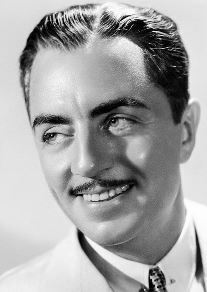 So, when Henry East was approached by William Powell wanting to purchase Skippy for a rumored great sum of money, he was turned down. Skippy worked for the Easts from 1934 to 1941. 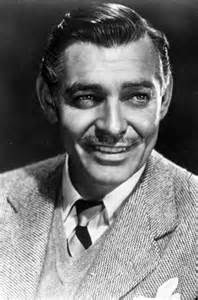 By the way, because the Easts had to disappoint the charming Mr. Powell, they presented him with a dachshund puppy to be named Jerry. Gotta love a man who loves dogs!!!!! 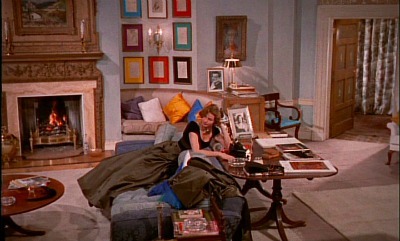 Ingrid Bergman's apartment in 1958's "Indiscreet"
Or Katherine Hepburn's in 1957's "Desk Set"
How about Gene Tierney's apartment in 1944's "Laura"
And then of course there is Jack Lemmon's apartment in 1960's "Apartment"
Or Lauren Bacall's apartment in 1947's "Dark Passage"
One of my favorites isn't an apartment at all but a chalet. 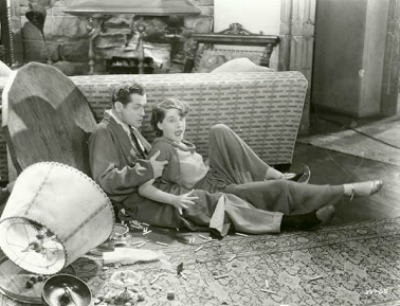 Who can forget Norma Shearer's chalet from 1931's "Private Lives"
Or for that matter how she and Bob destroyed it! A Green Dressing Gown and Yellow Scarf .... 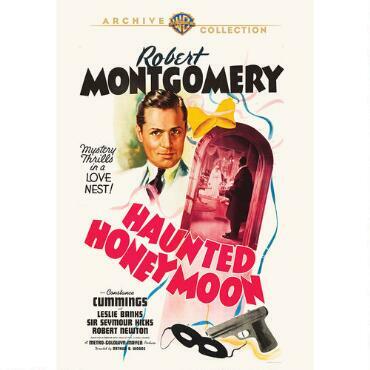 It Takes a Montgomery to Carry That Off! Frank Morgan was a superb actor. 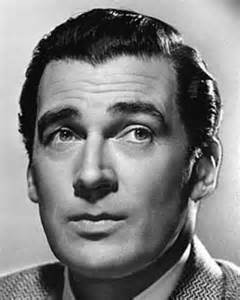 He co-starred with Bob in four movies starting with When Ladies Meet (1933), in which he portrays the married man with whom Myrna Loy wants to have an affair while putting aside the advances of her avid suitor Bob. 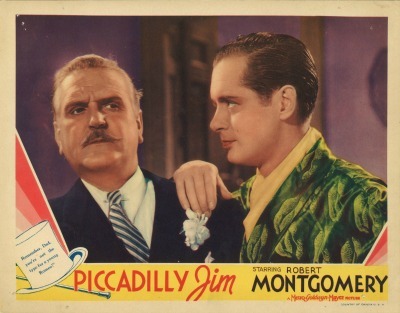 In Piccadilly Jim (1935) Morgan takes on the role of Bob's father and in Trouble for Two (1936) becomes a subordinate and fellow adventurer as the Colonel to Bob's Prince. 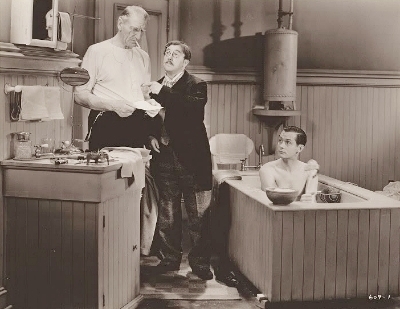 Lastly, he appears once again as Bob's competitor in The Last of Mrs. Cheyney (1937), both men pursuing Joan Crawford. And he is totally believable in all four roles. 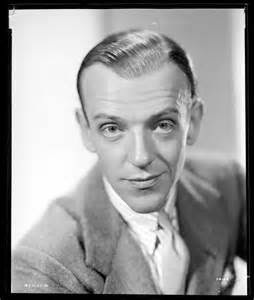 It is understandable that Morgan's main claim to fame is his excellent performance in The Wizard of Oz, perhaps an Oscar nominee in any other year but the golden year of 1939. The regret is that the one role overwhelms in popularity an entire career of excellent performances. Frank Morgan died in 1949, only 59 years old. There's another regret. I could swear yesterday was Sunday. But now I find it's Tuesday Night. Just what happened to Monday?! While I try to figure that out, enjoy a favorite photo of mine. Geesch.